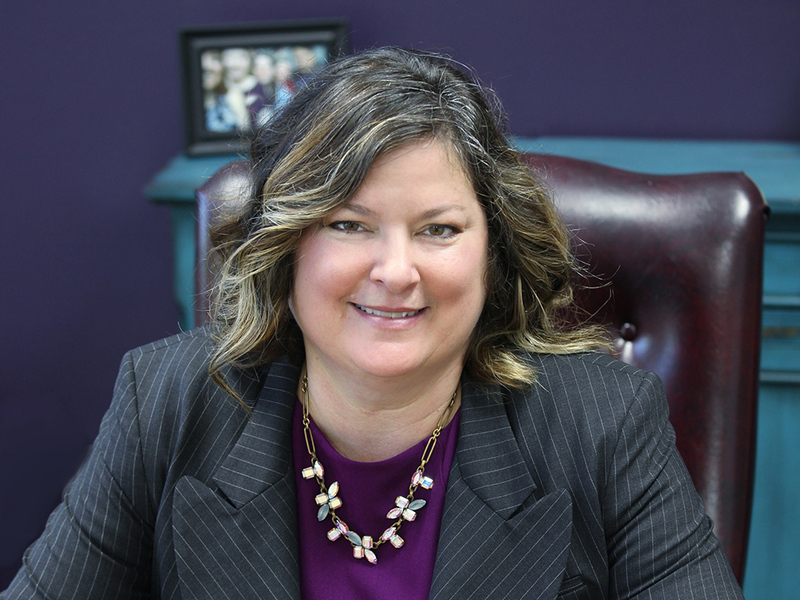 Dr. Jennifer (Wade ’92) Shewmaker, recently named dean of the College of Education and Human Services, believes the university is uniquely poised to take on the challenges facing higher education today. Shewmaker, who is a professor of psychology, took over her new role on June 1, 2018. She previously served as assistant provost for teaching, learning and inquiry, and as executive director of the Adams Center for Teaching and Learning. She graduated with her Bachelor of Science degree from ACU and her Doctor of Philosophy in Psychology from Texas Woman’s University. She is a nationally certified school psychologist and author of Sexualized Media Message and Our Children: Teaching Kids to be Smart Critics and Consumers. Learn more about Shewmaker’s background and hopes for the future in this Q&A. Would you describe the career path that led you to ACU? I attended graduate school at Texas Woman’s University, and once I finished my Ph.D. in School Psychology, my husband Stephen and I decided to go on an adventure and moved to Central Europe. We stayed there for five years, and our two oldest daughters were born there. It was a tremendous time of learning, both personally and professionally. During that time I worked with international schools and American medical clinics and grew to understand the joy of building relationships and knowledge across cultures. Once we came back to the U.S., a position in the psychology department at ACU opened up as the university was working to build up the graduate program in School Psychology, and I decided to apply. What initially attracted you to this university? When I came to interview for the psychology position, I hadn’t been back to ACU for many years. But the sense of purpose, vocation and community that I had found here as a student was still evident. I believe each of us are called to use our strengths and passions to be God’s agents of renewal, restoration and reconciliation in the world, and I felt very strongly that ACU’s mission aligned with that belief. Students choose to come here and faculty and staff choose to work here because we all believe in our mission to educate students for Christian service and leadership throughout the world. What we do here matters, it makes a difference in the world, and I wanted to be a part of an organization like that. What are your priorities as the new dean of the College of Education and Human Services? CEHS educates and empowers students to be God’s agents of renewal, restoration and reconciliation in the world. It is my goal that any student seeking a Christian education in the areas of teacher education or human services will understand that priority and see ACU’s College of Education and Human Services as the premiere place to obtain their training and degree. In order to reach this level of distinction, I’ll work to help us continue to grow in providing students with opportunities in experiential learning. These opportunities range from research with faculty to hands-on service to the Abilene community to the development of cultural agility through a regular schedule of study abroad experiences that challenge our students to think about how they might best serve and live in community in a global context. I also want to provide faculty with more consistent supported opportunities to develop as professionals, researchers and leaders, and to innovate in their teaching to provide expanded avenues for our students to grow intellectually, socially and spiritually throughout their time at ACU. What gives you the most satisfaction in your day-to-day work? It is exciting to be a part of CEHS. Each department and the college as a whole is focused on how to educate our students so they can best use their strengths and passions to make a difference in the world. We are highly service-oriented, and the faculty, staff and students in this college are constantly thinking of new ways to serve and share God’s love with those around us. The people I work with – faculty, staff and students – inspire me every day by their passion to serve. My primary goal is to give them the tools they need to continue to develop programs and courses that impact our world in a positive way. One of your focuses has been on media as it affects children, and you’ve published a book called Sexualized Media Messages and Our Children: Teaching Kids to be Smart Critics and Consumers. What inspired your interest in that topic? As a parent and someone who works with children and adolescents, I saw firsthand the ways that media have the potential to shape a child’s understanding of herself and the world around her. I wanted to help parents, teachers and communities, such as schools and churches, understand media’s impact and empower them to give children strategies to respond effectively to media. I believe that if we give children and adolescents the proper tools, they can learn to respond to and even create media in ways that are healthy and positive. You’ve had quite a career so far. Is there any single accomplishment that gives you the most satisfaction? I have loved having the opportunity to create and launch so many exciting programs here at ACU. From developing the school psychology master’s program to our STEM for Girls day camp for middle school girls to the programs that I’ve created for faculty teaching and innovation, each program has gone on to make a real difference in the lives of those who participate and those they eventually serve. I also really enjoy helping to identify just the right person who can take those programs and continue their development and increase their success. We have so many talented folks here at ACU, and being able to see a program I started flourish under their leadership is so satisfying to me. I am an avid reader, and lately I’ve read several books that have brought together ideas that are forming my own thoughts around the changes in higher education, and Christian higher education in particular. These books are Creativity Inc.: Overcoming the Unseen Forces that Stand in the Way of True Inspiration by Ed Catmull and Amy Wallace; The New Education: How to Revolutionize the University to Prepare Students for a World in Flux by Cathy N. Davidson; Robot-Proof: Higher Education in the Age of Artificial Intelligence by Joseph E. Aoun; Small Giants: Companies That Choose to be Great Instead of Big by Bo Burlingham; Essentialism: The Disciplined Pursuit of Less by Greg McKeown; and A More Beautiful Question: The Power of Inquiry to Spark Breakthrough Ideas by Warren Berger. What these books together have helped me see is that higher education is ripe for a reimagining, and I believe that ACU, with its mission centric work and manageable size, is in a perfect position to be at the forefront of this change. To flourish in this new environment, we need to be asking questions about how our mission can best thrive in this new era and how we can educate and empower students for world readiness. It’s no longer enough to prepare students for specific jobs. Jobs and fields are changing and flexing, so our students need to be prepared to be creative problem-solvers and communicators who can understand and work well with folks who come from different cultures, backgrounds and experiences. This is where experiential learning can be a huge component of a new model of education. What are the major challenges you see facing higher education and specifically ACU in the next few years? Higher education faces challenges as we deal with globalization, the continued advancement of artificial intelligence, and mounting student debt. But I believe ACU has the flexibility and ingenuity to step into the future with hope and excitement. Our mission is timely, and our ability to empower students to be ready to go into the world and make a difference is more important than ever. I am very excited about the emphasis we are currently putting on experiential learning. The research shows us that providing students with planned, systematic opportunities to use their knowledge and skills in hands-on ways increases their ability to apply it in other settings. ACU has excellent missions, study abroad and undergraduate research programs, and we continue to develop our internship and mentoring programming. I believe our excellence in providing experiential learning in a Christ-centered community will be key to our continued success as a university. Under your leadership, the College of Education and Human Services just participated in its first-ever Day of Service. What did that entail and was it a success? It’s important to me that our students understand the unique identity of the College of Education and Human Services. When students join CEHS, they join a community that is focused on excellence, service and belonging. I want every student in our college to have the opportunity to serve with excellence as a part of our college community. In the summer of 2018, when I had just been appointed as dean, I started thinking about ways our college could come together to serve the Abilene community. When I learned about the national MLK Day of Service, I knew it was a perfect fit. So for the first time this January, CEHS participated in the national MLK Day of Service. In 1994, Congress passed the King Holiday and Service Act, designating the MLK federal holiday as a national day of service, with the goal of addressing our nations most pressing problems. Our first College of Education and Human Services Day of Service was a great success. We focused on the issue of homelessness in our community. We had participants from across CEHS, including faculty, staff and students, who served in local agencies aiding our neighbors experiencing homelessness. It was such a joy to serve our larger Abilene community as a college and to give our students an opportunity to serve and love our community together. My husband, Stephen, and I met at ACU. We are both alums and now both work here, as he is the executive director of the Center for International Education. It is a blessing to be able to share a work setting and to be able to support students and the university together. We have three daughters who have basically been raised on the ACU campus! We began working at ACU when our oldest, Rylan, was 3 years old. She is now a 19-year-old college student. Our middle daughter, Catherine, is a senior at Abilene High School and is in the process of choosing which college she’ll attend. Our youngest daughter, Alexandra, is a freshman at Abilene High. I believe each of us has been a part of all of our successes. For example, writing my book was a huge undertaking as a mom of three, but my daughters and husband supported me every step of the way. My oldest daughter, Rylan, even built the index for my book! Rylan is an international relations and environmental studies major at Calvin College in Grand Rapids, Michigan. She is an officer in the school’s Food Recovery Network and Outdoor Adventure Club, and volunteers at the food pantry at her church. Sustainability and food access are important issues to her. Catherine is president of Abilene High’s Key Club and Abilene ISD’s Superintendent’s Advisory Council. Her extracurricular interests are cosmetology, theatre and theatre design for hair and makeup. Alexandra plays JV soccer at Abilene High, where she sings in the choir and is in theatre productions. She also sings in the Youth Praise Band at her church. Excellent article about a dedicated professor and Dean!